The Visitor Design Pattern enables a cleaner separation of data objects from the business logic that uses that data. Whereas a session business object uses the data object to perform work, the Visitor Pattern is used to manipulate the internal data of the object for some external business purpose. This article will explore the use of the Visitor Pattern as it relates to applying a business service to an object graph of aggregate objects as opposed to changing the underlying code of the objects involved. Most examples of the Visitor Pattern show traversing through data structures such as linked lists, however, as application programmers we tend not to deal with raw data structures as much as we do collections of objects in inheritance and aggregation relationships. The example object graph used to demonstrate the Visitor Pattern will consist of a group of Order objects that each contain a Collection of Item objects. We will then construct an ItemPriceAdjustmentVisitor whos job it will be to change all of the prices of a given Order's Items by an increase of 1.33 if the Item's price is below $22.00. Our simple object graph consists of a Collection of Order objects each aggregating a Collection of Item objects as shown below. The Visitor Design Pattern uses to interfaces to form its structure: Visitor and Visitable. A visitor object implements a Visitor interface which at minimum has a visit() method. The Order and Item objects - which implement a Visitable interface - both have an accept() method. A Visitable object accepts a Visitor (i.e. this.accept(Visitor visitor)), and a Visitor visits a Visitable object (i.e. visitor.visit(this)). These interfaces are very simple and are shown below. * Provides a simple Visitor interface for the Visitor Design Pattern Example. * Provides a simple Visitable interface for the Visitor Design Pattern Example. A Visitor is like a plumber who is called to a house to fix something. The house is "visitable", i.e. it allows Visitors to enter. However, it doesn't know how to fix the plumbing, so it calls a plumber. The plumber, however, doesn't know anything about the house. It only knows about plumbing. The house knows about itself, so when the Visitor comes in the house, the house doesn't even know whether the Visitor is a plumber or electrician or painter. But it does know that it has rooms. So, when a Visitor enters the house (programatically through the house's accept(Visitor visitor) method), it allows the Visitor to look at it first. It then shows (i.e. passes) the Visitor to each room in the house (through each room's own accept(Visitor visitor) method). When the Visitor enters a room (as it did when it entered the house itself), it knows if that room has plumbing or not. If no plumbing is in the room, the Visitor does nothing; if there is plumbing, then the Visitor does what it is programmed to do. Interestingly, the way the Visitor checks each room to see if it is interested in it is to have the room pass itself into the Visitor's visit() method (i.e. visitor.visit(this)). The Visitor thus has access to the internals of that room/object. This is how it determines if it has any work to do with that particular object. 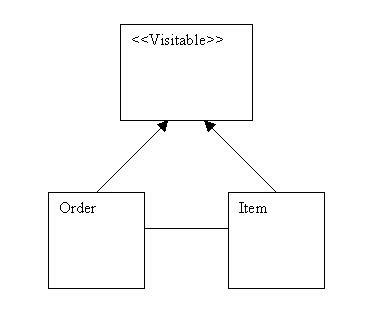 This process of the Visitor being passed in through the Visitable object's accept() method and then the Visitable object being passed into the Visitor through its visit() method is called "double dispatch". As per our business requirements, we want to create a Visitor class to "…change all of the prices of a given Order's Items by an increase of 1.33 if the Item's price is below $22.00". To clearly represent this requirement, we will name our Visitor ItemPriceAdjustmentVisitor.java. It will be coded as follows. Notice the simplicity of this class. It is designed to do just one thing: make a price change where appropriate. We could also populate an instance HashMap or ArrayList property that would return to us a list of Item objects whose price was adjusted. Thus, we are completely flexible in our ability to manipulate the data in selected Item objects through a Visitor in anyway we see fit without altering the Item class itself. Look closely at how the visit() method functions. The parameter is of type Object so that any Visitable object may pass itself into this visitor if its use could be functional somewhere else, i.e. reusable. For example, if we wanted to do something different in each Order object - such as return a list of orders visited for Item object price adjustment - the we could add an additional instanceof conditional for that purpose. The beauty of double dispatch is that the Visitor has access to all of each Visitable object's internals without having to worry about which specific object it is dealing with. The business rules for the Visitor are totally encapsulated. ---> Order 1093884593337 has accepted a visitor. ---> Item 1093884593337 has accepted a visitor. ---> Item 1093884593397 has accepted a visitor. ---> Order 1093884593397 has accepted a visitor. * Provides a simple Visitor Design Pattern Example. * price of all Item objects. * Provides a simple Visitor interface for Visitor Design Pattern Example. * Provides a simple Visitable interface for Visitor Design Pattern Example. * Order object is a container for ArrayList of associated item objects. * An Item is an aggregate object of an Order object. * Items by an increase of 1.33 if the Item’s price is below $22.00.